It is a great challenge to secure survival for the small but proud confederation. External reactionary forces put the country in danger. But there are a handful of people who don’t give up on a vision for a better tomorrow. 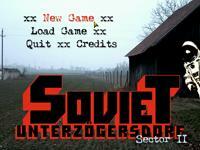 Let us tell you the stories of the brave citizens in the beautiful little country of Soviet Unterzoegersdorf. Soviet Unterzoegersdorf (pronounced «oon-taa-tsee-gars-doorf») is the last existing client republic of the USSR. The soviet enclave maintains no diplomatic relationship with the surrounding so-called "Republic of Austria" or with the capitalist fortress "European Union". The downfall of the people's motherland -- the Soviet Union -- in the early 1990s had a devastating effect on the country’s intra-economic situation. External reactionary forces threatened the last remaining proletarian paradise. Party secretary Wladislav Gomulka has been kidnapped and is being held in US-Oberzoegersdorf. We must save comrade Gomulka! Because communism isn't an opinion. It's a promise.